The ecommerce giant is eager to boost membership of its Prime service. Since Jeremy Clarkson was forced to leave the BBC after getting upset about a plate of food, speculation has been swirling about where the controversial but hugely popular former Top Gear presenter could go next. 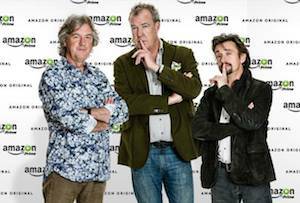 After the Beeb’s main competitors Sky and ITV expressed disinterest, online streaming site Netflix was the suitor most hotly-tipped to sign a deal with Clarkson and his sidekicks James May and Richard Hammond. Today it emerged the trio will make an as-yet unnamed show with Amazon Prime Video, Netflix’s closest rival, in a deal that comes as a massive coup for the ecommerce giant - even if it is paying a whopping $250m (£160m) as reported in the FT.
After realising it could only make so much money by selling lots of stuff really cheap, Amazon has been keen to tie in as many people as possible to its Prime service, which costs £79 per year in the UK. Initially Prime was just a way to get cheaper next day delivery but it’s since been expanded to include access to TV, film and music streaming, a Kindle ‘lending library’ and free cloud storage. The company has recently been looking for more effective ways to expand its reach, such as its attempt to single-handedly create a summer equivalent of Black Friday in the form of Amazon Prime Day (which offered big members-only discounts on tech and entertainment products) earlier this month. Today's announce should net Amazon a decent tranche of new subscribers. Like them or loath them, Clarkson and co have a massive fanbase around the world. Chris Evans and the rest of the team tasked with reviving Top Gear for the BBC will have to pull out something very special if they want to have any chance of competing with Clarkson's star power and Amazon's cash.